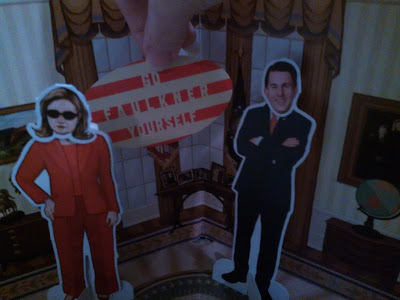 10 Paper Dolls, Three Rooms of Fun, Republican Adversaries, Presidential Pantsuits, White House Ghosts, and More! I love paper dolls, so I couldn't resist the lure of a set of Hillary Clinton paper dolls. This set has everything you need. It unfolds into three backgrounds for your scenes. It has a pouch for storing the pieces. It has Hillary, with several outfits and even more faces. It has Bill Clinton, a variety of Republicans, a Secret Service agent, Supreme Court Justices, and an eagle. It even has a few props. Each piece is on sturdy paper with thick tabs. It is fairly easy to punch them out without ripping the pieces, although it takes a bit of care. The pieces fit together well, even the facial expressions. Caitlin Kuhwald's art captures the recognizable faces well. We all know Hillary wants to tell Scott Walker to Faulkner himself. Sticker courtesy of #ShutDownNouvella. 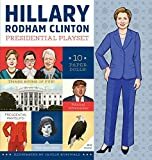 The HILLARY RODHAM CLINTON PRESIDENTIAL PLAYSET is cleverly designed and a great gift for anyone in your life who isn't afraid of having a little fun with politics. Better yet, you can buy it for youself. You know you love paper dolls too. Bonus round: Paper doll Ruth Bader Ginsburg meets tattoo Ruth Bader Ginsburg on my Instagram. I apologize for my inability to take photos with my left hand. hah! This is such a fun gift idea for that person in your life that can take humor with their politics. You just have to laugh sometimes!!! You do! It is pretty hilarious.